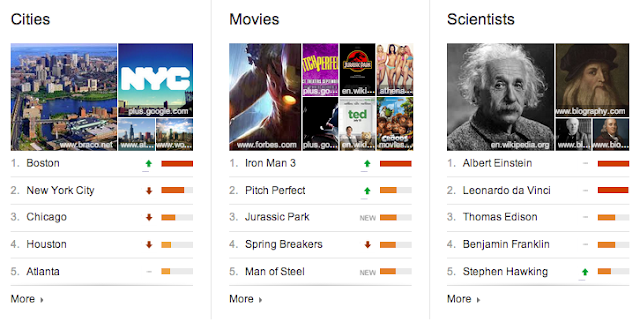 Every year in the month of December Google releases their Year in Review based on Search popularity. The purpose of this list is to provide people an opportunity to reflect on the people, places, and moments that caught people's attention throughout this past calendar year. The first review I suggest viewing is the Year in Review Video which is embedded below. This video would be a great video to show for a free writing activity, or as an introduction for a research project where students research the major events during their birth year or in another time in history. For the year 2013 users can also examine the 3D Global Map that will allow users to discover popular searches for by day for cities around the world. This would make for an interesting examination of what is popular for different regions of the world and be a popular activity in Geography or Sociology classes. To examine previous years top searches and stories, visit the Google Zeitgeist Home Page for direct links to 2013 or the Trends Home Page for previous years back to 2001. 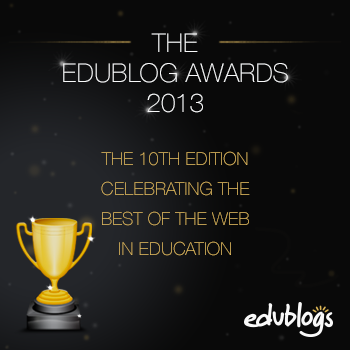 Celebrating 10 Years of the Best of the Web in Education, the 2013 Edublog Awards are now accepting nominations. Nominations are open till December 1st. To nominate the best of the web for awards, people must post their nominations in a blog post (Mine will be available soon) or on their website and then share the link to the nominations (instructions to do so are at the link above). There are 19 different categories for awards . You can visit their website and also see previous winners, which for new people to looking to start reading blogs is a great place to start. Here is a link to last years results. WASHINGTON (AP) — With most of its 137 million objects kept behind the scenes or in a faraway museum, the Smithsonian Institution is launching a new 3D scanning and printing initiative to make more of its massive collection accessible to schools, researchers and the public worldwide. A small team has begun creating 3D models of some key objects representing the breadth of the collection at the world's largest museum complex. Some of the first 3D scans include the Wright brothers' first airplane, Amelia Earhart's flight suit, casts of President Abraham Lincoln's face during the Civil War and a Revolutionary War gunboat. Less familiar objects include a former slave's horn, a missionary's gun from the 1800s and a woolly mammoth fossil from the Ice Age. They are pieces of history some people may hear about but rarely see or touch. Now the Smithsonian is launching a new 3D viewer online Wednesday with technology from 3D design firm AutoDesk to give people a closer look at artifacts in their own homes. The data can also be downloaded, recreated with a 3D printer and used to help illustrate lessons in history, art and science in schools. While some schools might acquire 3D printers for about $1,000, other users may examine the models on their computers. Smithsonian digitization director Gunter Waibel said museums are working to redefine their relationship with audiences to become more interactive. "Historically, museums have just tried to push data out. It's been a one-way street," he said. "Now museums are really rethinking their relationship with their audience, and they're trying to empower their audiences to help them along whatever learning journey they're on." With the cost of 3D scanning and printing equipment declining in recent years, Waibel said there's a new opportunity for museums to transform how they collect, curate and conserve artifacts and also how they educate. Three-dimensional models can help tell stories and create more engaging lessons, he said. Smithsonian educators are building interactive tours to view 3D models online. On the Wright Flyer aircraft from 1903, they have created hotspots to help explain its engine and wing design, and users can rotate the object in all directions for a closer look. With two Lincoln masks, the 3D viewer allows the user to adjust lighting levels to see the aging of the president's face over the course of the war. And a 3D scan of a Chinese Buddha statue allows users to examine and unravel a story carved in its surface. So far, the Smithsonian is devoting about $350,000 annually to 3D digitization, with companies also donating equipment. But museum officials are working to raise $15 million going forward to move the 3D lab from a suburban warehouse in Maryland to a new innovation center planned for the National Mall. There, the public could see the latest 3D technology and even make their own 3D prints of museum objects in a "maker lab." Within minutes, a 3D printer can create a plastic replica of an object by reproducing the digital model layer by layer. Other 3D printers can reproduce objects in fiberglass, stone powder, ceramics, metal, rubber or other materials. It's not clear how long it will take to create a large 3D collection. The pace will depend on funding and scaling up techniques the 3D lab has just begun creating, officials said. For other digitization efforts, the Smithsonian has engaged private partners and may even recruit volunteers to help. In total, the Smithsonian aims to eventually digitize 13 million objects in either 2D or 3D. Smithsonian Secretary Wayne Clough has made digitization of artifacts a high priority since he arrived in 2008, but only more recently has 3D scanning and printing become affordable. In an interview, he said museums face a greater challenge than the digitization of documents in libraries or archives because museum artifacts are often three-dimensional. In a new e-book published this year, Clough called on museums to speed up their work to innovate and digitize collections to make artifacts accessible for a generation born in the Internet age. A strategic plan in 1927 once called for the Smithsonian to have an office in every state so it could reach more people, though that never came to pass. Now with more digital outreach, the museums could actually realize that dream, Clough said, with the potential to reach billions of people. "If we look at this issue of reaching people, it's more important than ever before," Clough said, noting that museum visitation among minorities is already low. For museums that received government funding to get their start, he said governments are now saying "what's next?" "What's next is you have to reach the schools," Clough said. "Your relevance is going to be really based in part on how much you're contributing to the educational process for young people." While posting data online to easily replicate important artifacts might lead to some attempts to counterfeit objects to sell, Smithsonian officials said the data is provided only for educational and non-commercial use. Other museums have also started digitizing artworks or making 3D scans of sculptures. In New York, digital guru Sree Sreenivasan was hired this year as the first chief digital officer at the Metropolitan Museum of Art. Smithsonian officials said they are making a unique push into scanning a wide variety of 3D objects, ranging from an ancient whale fossil found in Chile to a 3D image of a supernova in space. Some of the latest 3D technology also could transform the experience of visiting a museum. The Smithsonian is experimenting with new projections of augmented reality with 3D imagery to help bring dinosaurs or historical figures to life in an exhibit. "Wouldn't it be great to have Abraham Lincoln walking around talking to people?" Clough said. "It can be done." I know it has been a while since I posted anything on this blog (over two months) but I came across this resource today and thought it is well worth sharing. Surfly is an tool that allows users to share a link to a webpage that they would like users to surf with them. In the age of One to One the teachers ability to showcase a webpage to students at the same time they are using it would be very beneficial. Registering for the site is as simple as providing an email address and a password and then agreeing to the terms and service. With Surfly, all you do is provide a link and then when users visit the site their arrow is highlighted and users can show them certain areas of the website they are surfing that they want them to focus on. Surfly would be a great tool to teach students about authentic resources and information on websites, how to use Wikipedia for research, the steps to create usernames and passwords, or use the various web 2.0 tools that are available. Surfly works on any device as well, so if you are using iPads or Tablets, you can use the service as well. For more information, see the video below. Animoby is a new free iPad app that allows users to create presentations, tutorials and animations with drawings, pictures, and even audio. A version for Android will be available in the future. Users can create various types of presentations and activities in all types of subjects. There is even a way to create a game of checkers. Users have a pencil tool, highlighter, and pointer, like other tools available, that allow interaction with the app. There are several templates available as well. For new users there is a large library of tutorial videos available. For a quick introduction, see the video below. Classmint is a new services that is currently free that allows users to create annotable, audible, and interactive notes. Notes can be kept private or they can be made public and shared. An automated revision list makes it easy to aid in timely revisions of the notes. Users can add complex math, computer code, images, explain notes with text, and then annotate images as well. The notes will then be read aloud if so desired. Users can annotate images and then mouse clicks will enable users to see the annotations. To learn more about Classmint, see the video below. Within my position as Curriculum Coordinator I have become an avid user of Excel and have started to learn about many of the features it has for formatting and examining data that has made my job a lot easier. I created a spreadsheet with room for 25 students that will automatically color code the subject matter and modifications that the child receives for easy tracking of what is on the student's IEP. There is also a place for notes as well. If you are interested in such a product I have made it available for only $5.00 on Teacher Pay Teacher. I have recently taken on and accepted the head volleyball coaching position, so I am dedicating a lot of time to practices and getting the team ready for the start of the season. This coming school year also brings challenges as I am also going to be the Building Assessment Coordinator. I will be very busy to start out the school year with both of these new positions, so I am not sure how often I will get to contribute and author posts to this blog. I hope that all my fellow educators are having a great summer and good luck with your coming school year. I have previously wrote about Realtime Board which is a service that provides users the ability to collaborate online using a whiteboard like feature. Recently it was announced that educators can get a FREE Pro Account by providing their school email and potentially providing further proof of being an educator. The summer time is a great time to sign up and learn about Realtime Board and other programs so that once school starts back you are familiar with it and are able to share it with your students. Flipboard started as an iPad app that allowed users to take content from the web and turn that content into digital magazines for reading. Users could select Twitter feeds, Facebook, RSS, and other methods of receiving content from the web. Flipboard has made a bookmarklet available that allows users to create and edit magazines for the purpose of turning content into a digital magazine. Users can have different magazines for different types of content and also import a magazine "cover" of their choice. To learn more, check out the article on Make Use Of about the bookmarklet and how to set up a reader using the Flipboard service. Favebucket is similar to Pinterest in that it has a layout with boards (called buckets), the major difference is that sharing is a bit more individualized to certain content instead of everything. Users can pick and choose what they want to share. Signing up requires Facebook, Twitter, Google, or an email address and then users will want to install the bookmarklet in order to gather content from the web. After creating an account users will have an existing lists of buckets and tags. Currently there is no renaming feature (you can create new ones), but that is in the works. Users can views their "Faveboard" in various ways and from an available menu access their inbox, favorite and private links, and more. To save a link or create a bucket users must utilize the bookmarklet. There is currently no feature that allows users to save from within the website. Creating a new link allows users to select a bucket, enter a description and add tags on your own or from a suggested list. Each link can then be viewed, shared, and organized to fit your bookmarking needs. Favebucket would be a valuable tool for students doing research projects or teachers organizing resources for lessons. When I first started blogging Twitter was a great avenue for me to share what I was writing while also providing me with ways to discover and interact with other bloggers and educators from around the globe. Over time with different jobs (from TIS, to Classroom Teacher, to Curriculum Coordinator) and two kids, my influence and use of Twitter has not been as professionally oriented as I would like, but has still provided me with a method of staying connected to educators and education resources. Below are some tips that I have learned that help me continue to gain followers and grow my PLN. 1.) Use a service like Twitterfeed or IFTTT (If This Then That) to automatically tweet blog posts from your favorite bloggers. You can copy their RSS feed and add a mention and hashtag (the hashtag is the important addition). Anytime they create a new post you will automatically tweet their blog post. I have gained several followers through using these services. One person did this for my blog when I was more active on Twitter and with my blog; often times her tweet would go out before my own. 2.) Blogging services often allow users to log in to comment on blog posts using their Twitter account information. When commenting on blogs, utilize your Twitter account; then when comments appear on those blogs, readers will be able to connect with you. 4.) Search for hashtags and chats in your selected area of expertise, follow those chats, and then start participating in the discussions. This is a valuable way to not only gain followers and discover new people to follow, but it also helps you easily find people who share the same interest as you. You can find a chat for different levels of education, different subjects, for administrators, coaches, etc. When I went back to the classroom for a year I found myself looking at the Social Studies (#sschat) feed daily to discover the newest resources. I highly reccomend viewing the Index of Education Chats Google Doc to learn more. 5.) Twitter allows users to create lists. If you create a public list and add people to it, Twitter notifies users when they are added to a list. Lists are also a great way to organize who you are following and also lets other users know that you value their tweets enough to add them to a list so they don't get lost in the Twitter feed. This notification might be enough to encourage someone to follow you back. If you are transitioning or utilizing Google+, Tip 1 and 2 would apply as well. Remind 101 is a service for educators that allows users to SMS students, parents, players, community members, etc about what is going on in their classroom. I have written about the service before and have used it myself with my classroom. On their blog they announced today some changes to their website and service. Through discussions with teachers and users, as well as from their own ideas, the creators of Remind 101 have worked to make some great improvements to their product. From those discussions they realized the need for improvement for tablet use on the website, messaging to multiple classes, improving sign up process, and improving scheduling of SMS messages. To learn more about the redesign, see the video below. Today is June 6th, the 69th anniversary of the D-Day invasion. The D-Day to Victory Interactive is a valuable addition to websites about the history of the invasion. Users must have updated Java for the interactive to function correctly. The D-Day to Victory Interactive is an online documentary experience recreating the WWII final assualt on Nazi-occupied Europe. The site features veteran interviews and traces the Allied journey from the D-Day invasion of Normandy to the seige of Berlin. Users can engage in virtual commemoration and online sharing of the stories of veterans of a WWII who may be discussing the war for the last time. 3D scenes help visualize and illustrate the sounds of D-Day. Each scene can access hundreds of original veteran video interviews that provide realistic documentation of the war. Useres can also view interactive poppies" which provide the views and thoughts submitted by others. Stories by veterans are coupled with biographies, artifacts, and personal photos that can be shared on social networks. For more information, see the video below. From Blackboard comes the free* SMS program T!PTXT for schools that hopes to help combat bullying in schools. To K-12 schools, Blackboard is offering administrators with an easy and confidential way to speak up about abuse, crime, and mental health issues. The offer includes free access to the TipTxt service, a TipTxt mailbox, and TipTxt client support for each individual school (*$125 per year for the TipTxt line). Our district recently did something similar by purchasing a cellphone for our School Resource Officers that allow students to text tips to the officer anonymously. It's a high school version of CrimeStoppers. To learn more about TipTxt, see the video below. VideoSci is a website dedicated to providing videos related to science in various categories. Online videos have exploded which allows users to incorporate videos into their classroom lessons rather easily. VideoSci aims to collect all the video streaming resources from all the fields of science from all over the Internet. Videos are streamed from any video source. Each video comes with information, commenting, and a rating system. Tags and categories allow for users to discover the various videos as well. Facebook and Twitter integration allows users to easily use their social media accounts to comment and suggest videos. There are also articles as well. So Windows 8 came out a while back and I don't have it on any computer that I am using, but I have heard from those that have started using it that they were unhappy with the changes. It's hard to completely adjust to a new interface and Windows did that in order to meet the "need" of touchscreens. With Windows 8, they forgot one crucial piece of their product...a "Start Button." With a new release of 8.1 they have added a start button. You can learn more about the Start Button and other features in the video below. The upgrade from 8 to 8.1 is free. Been off of my computer for a while. With two kids at home and it being summer, only time I have a chance to blog is when both of them are not at home. Today is one of those days. From my time away, here are some of the top posts from my Feed.ly recently. 1.) and 2.) From A Media Specialists Guide to the Internet comes two lists. 20 Places to Find of the Year Resources is a valuable list for units, activities, games and more. 21 Websites with Summer Reading Ideas for You and Your Students provides lists of books for various grade levels for students and for teachers. 3.) 10 Ideas to Move Innovation Forward comes from The Principal of Change Blog and provides teachers with ways to be more innovative in your classroom and schools. 4.) and 5.) 10 Excellent Digital Citizenship Tops for Students and Kids is an infographic with Do's and Don'ts for the Internet and comes for the Educational Technology and Mobile Learning Blog. Also from this blog is 50 Google Docs Tips Every Teacher Should Know. This is a list of archived blog posts related to Google Docs. 6.) From the Technology Tidbits: Thoughts of a Cyber Hero blog comes 40 Sites and Apps for Creating Presentations. Some of these are new to me and they can be found in alphabetical order as well. 7.) From Edudemic comes 35 Useful Apps and Web Tools for Math Teachers. This is a good list with short descriptions and the ability to up or down vote the resources. They can be viewed alphabetically, by rank, newest, etc. 8.) 10 Ways to End the School Year on an Up Note when You're Exhausted is a great post from the Cool Cat Teacher Blog. Most teachers slowly wear down as the year goes on and these tips can be helpful towards ending the year positively. These can also be great reminders throughout the school year as well. 9.) Going Global - Tips ad Resources for Global Collaborations provides teachers with tips, information, and resources to globally connect with other educators and the benefits of doing so. This comes from the Blogging About the Web 2.0 Connect Classroom. 10.) From the U.S. History Teachers Blog comes an interesting share from the Washington Post; 31 Charts That Will Destroy Your Faith in Humanity. Several students learn visually and these charts could be helpful for economics, sociology, and geography teachers. At the same time, in advanced classes the charts could provide some interesting writing prompts as well. WAY back in November of 2010 I wrote about Blekko while it was still in beta and never really gave it much thought after that. Recently Blekko has gone through some changes to make search results for user friendly and different from what we are used to on other search engines. Results from searches are now automatically broken down into various categories of different content. When you search for something you get both the top and latest results as well as specific searches related to your original search. This new layout allows for more results on one page and the search will automatically adjust to your screen size for mobile devices. Users can also search Blekko for images and videos as well. If you have never seen Blekko and are unsure of what a slashtag is, basically it allows users to easily create a custom search and helps to narrow down a search. The slashtags are a tool that is used to help filter search results while helping to eliminate spam and content farms. For more information about slashtags, check out the tutorial. Money As You Grow is an initiative of the President's Advisory Council on Financial Capability and has been selected by the American Library Association as one of its Great Websites for Kids! The site breaks down financial literacy activities into five different age ranges ( 3-5, 6-10, 11-13, 14-18, and 18+). Activities are available to help students understand money, finance, spending, protection, online safety, savings, credit, investing, and more. Each area has multiple activities to help students become better stewards of their money. With Money As You Grow, Teachers can download a free poster as well that helps to share the steps related to money at each age range. See a sample of the poster below. The steps that you see are also the topics that have activities associated with them. As a native of Louisville where the Louisville Slugger bat is crafted, baseball has always been a part of my past time. From watching the St. Louis Cardinals to trading baseball cards I have always been a fan of the game. From Exploratorium comes The Science of Baseball which allows users to test their fastball reaction time (requires Flash) or see what makes a home run (requires Shockwave). There are also articles and other activities of interest related to baseball and science. For history teachers there is also information about women in the game and other historical aspects of baseball. For math teachers they provide statistical information that can be used to understand mathematical concepts. If looking to make a lesson more relevant during the spring time period or bring a baseball lesson into the classroom on Opening Day, check out The Science of Baseball. 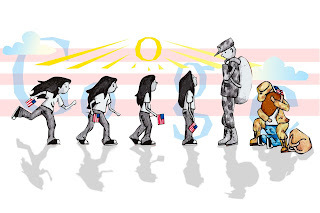 The image above is the winning doodle in the Google 4 Doodle Contest and thought I would share it here while also sharing some search changes in Google Gmail. Google announced today that users will be able to see relevant emails, calendar events, Google Drive files and more (in the future) as they type a search query in their Google Gmail account. The search feature will only be rolled out to English users at first and will be happening during the coming week. Some users have already been using the feature as they opted in to the opportunity and from those users the trial period appeared to be a success. The search feature works by providing users a drop down from the search bar with icons and information of different results from the predictive text of the search query. You can see in the image below what it looks like. Over time unification across various Google products appears to be the long term goal. On the Google Official Blog today they announced the ability to track the most searched people, places, and things on a monthly basis. Google does this at the end of every year with the Zeitgeist Reviews, which I wrote about in December, but are now making it available more often. With Google Trends Charts users will be able to see what is hot right now, while also exploring the history and geography of a topic as it evolves. Charts are available in over 40 different categories. As a social studies teacher, the Google Trend Charts would provide relevant information about historical events and would provide interesting discussions in sociology and psychology classes. The Google Cultural Institute is a must bookmark for any social studies teacher looking for primary sources of images and text from our history as Google helps to preserve and promote culture online. The site provides a visually rich and interactive experience for telling stories in new ways. Teachers and students can discover exhibits by expert curators, find artifacts, view photographs, read original manuscripts, watch videos, and more. Users can explore various channels and collections while also researching different time decades and projects that the institute is currently working on. In the future, users will be able to create their own exhibitions, therefore collecting the history of their home town. To learn more about The Google Cultural Institute, see the video below. If you are on Twitter then you are probably aware of the recent compromising of some big time Twitter accounts, the Associated Press in particular and other instances of phishing scams. Users now have the option of having two-factor authentication through SMS to help protect their accounts from hacking and phishing scams. If multiple people use one account (schools, school districts, athletics, classrooms, etc) it will only send the authentication to one phone number. Two-Factor authentication works by allowing users to require the verification and each time you sign in a code will be sent to your phone which will be needed to access your account. This is not EVERY time you sign in, but when it is a first time from a new device or computer. To learn more, see the short video below. In Chicago on July 24-25, Google will be hosting their next Google Teacher Academy. This is a free opportunity for professional development for educators and it happens all over the globe, therefore providing an opportunity for more professional networking. If your school or district is planning on utilizing Google Apps in Education then attending this conference would be a major plus. Applications to attend must be submitted by June 10th. Visit their application page to apply and visit Google Teacher Academy homepage to learn more. Outstanding educators with a passion for using innovative technologies and approaches to improve teaching and learning. Creative leaders who understand opportunities and challenges, and have a desire to help empower others in their local community and beyond. Ambassadors for change who model high expectations, life-long learning, collaboration, equity, and innovation. Lead at least three local professional development activities over the course of 12 months. Successfully deploy one school on to Google Apps for Education. Actively participate in the GCT online community. Share the impact of their work with other Google Certified Teachers through mid-year and end-of-year reflection. Access to the GCT Online Community. Opportunities to give feedback to Google on educational uses of tools. Invitations to join Google at special events. The right to post the GCT web badge on their website or blog. Over at The Edublogger, which I have shared in my Found From my Feed.ly posts, is conducting a survey to learn how educators are using blogs and obtain a comprehensive resource on the the State of Educational Blogging. Please visit her post and complete the survey if you are an educational blogger or use blogs for your teaching or within your school. If you have students that are blogging, then please complete the survey. The survey does not take that long to complete and can be a very beneficial piece of understanding how blogs are being used now and in the future as this survey is made available each year. To go directly to the survey, you can CLICK HERE. Today is closing day meaning yesterday was the last day school. Summer time is here and I am looking forward to the break to play some golf, visit the beach, and attend some conferences. In the meantime, here are 5 posts from this week so far. 1.) From the Simple K12 blog, 17 Free eBooks for Your Summer Reading. If unsure what to do this summer to grow professionally, these eBooks would be a good starting point; and you can't beat free. 2.) Our school currently is not 1:1 but many schools are. Several schools are also investigating a BYOT/BYOD program and it can provide the same incentives and opportunities. From Free Technology for Teachers, a guest post with the Top 10+ Sites for a Successful 1:1 Laptop Program: Experiences from the Trenches. I am familiar with many of these sites and agree with their use for a 1:1 program. 3.) Google is on the verge of taking over education and they provide great services at a cheaper price than Microsoft and Apple at this point. If you are not a Google User, then Google Tools to Check Out from the Blogging About the Web 2.0 Connected Classroom is worth checking out to discover or re-discover tools from Google you might be interested in. 4.) Speaking of Google, at the recent Google I/O event there was an announcement about Google Play for Education. On the Hack Education blog they provide some valuable information about Google Play for Education Versus.... A valuable look at how Google Play compares to some other options. 5.) The Tornado in Oklahoma is on a lot of educators minds because of the toll that the event took on children and teachers due to the direct impact to two elementary schools. Larry Ferlazzo continues to track news stories and videos of the event. Teachers Putting Children First in Oklahoma and More on Oklahoma Tornado are good starting points. There are more links within those two posts to original information. As a bonus I shared an article on Twitter about The Courage of Teachers which is an Opinion Piece on CNN regarding the bravery of teachers in Oklahoma and more. I HIGHLY RECOMMEND it for an end of year reading piece. Iraq - 10 Years, 100 Viewpoints is a web-documentary that showcases life in Iraq that went live on May 1st, the date that President Bush declared "Mission Accomplished." It is hard to believe that it has been ten years since I watch bombs fall on Baghdad while doing my student teaching. For social studies teachers this documentary can provide a lot of useful information about this time period in U.S. and World History. I can also help teachers share the geography and culture of the region as well. Learn about what it is like for Iraqis following the war and how religion, government, and economics plays a role in their daily lives from 100 different perspectives. Users can add different videos to their library for later viewing. Videos are also organized by 9 different categories and various tags as well. Numbers. We see them everywhere and we share them in our classrooms, but often times when we are sharing numbers with students they struggle with comprehending how those numbers equate to real life or relating them to something they might be more familiar with. Dictionary of Numbers is a Google Chrome extension that helps to try and make sense of the numbers we encounter on the web. The extension will take a number and put it into human terms. For example, "4 million people" means little, but "population of Kentucky" will help to mean more and make numbers more relevant. The extension works in several ways. Dictionary of Numbers searches through the page for numbers it can understand and when it finds one, it will add in an inline explanation for that number in human terms. The extension also contains a search as well, so if a you are teaching a lesson and it involves numerical data that you want in human terms, Dictionary of Numbers will help. For more information, see the video below. h/t to Lifehacker for the find. Another solid job of blog posting by the people in my Feed.ly the past two days. Speaking of two days, that is how many students have left in school for us. Hard to believe how fast the year has gone by. Looking forward to summer break and hitting the golf course. 1.) Tip of the Week: End of the Year Self-Reflection and Student Evaluations is a post by the History Tech blog that I read. Reflection is a large part of being a teacher. Teacher evaluation is changing in Kentucky and part of the process will be student evaluation. This post provides some samples of evaluations that students can use for evaluating their teachers. 2.) Four Approaches to Getting Content OFF Elementary Students' iPads - No Email, No Problem, Part 2 is a guest post on Free Technology for Teachers. Teaching high school I failed to even think about how "being under 13" prevents elementary students from having access to tools that high school students have access too. If you are an elementary school using, or contemplating using iPads, this is a must read. 3.) How Can I Make My PowerPoint Presentations Amazing is a post on Lifehacker that I thought was worth sharing, because even with all the new "Web 2.0" tools available, it is still the predominant lecture method in schools. If it is going to be used, it would be worth while to ensure that it is a presentation that really gets participants attention. 4.) Yesterday was a big Google conference and they unveiled a ton of new software and upgrades. One of those was the Google Play Music All Access. Streaming music is popular (and although it takes up bandwidth in schools, it is still a tool to be utilized) and more companies and apps are getting into the music industry through streaming music. Google Play Music All Access: Should It Be Your New Streaming Service? is another post of Lifehacker that helps readers understand the differences between various streaming music services. 5.) With the end of Google Reader comes a need for a new RSS service and for some teachers starting something new when it comes to technology can be frustrating. Over at The Edublogger, the Educators' Guide to RSS and Google Reader Replacements is a great post for teachers looking to keep their RSS feeds going and are wondering about possible alternatives for Google Reader. Clickberry is a new service that allows users to tag and add aspects to their videos during play. The tags can provide names, information, links, pop-ups and more. Clickberry requires users to install an extension in Chrome or Firefox to use the service. Users can define clickable regions within the video enabling users to highlight important moments or important parts of a video. The service also becomes a social service as users can add Facebook "Like" buttons as well. For an introduction, see the video below. For those iPhone Users, there is the Clickberry Tagger app that allows users to tag and make videos interactive from their phone. For Windows, Mac, and iPad there is the Clickberry Interactivity Creator. I could see teachers utilizing the service to help students identify people in videos that they are studying or helping students focus on an important fact shown in the video. Videos can be a valuable tool in the classroom if used correctly. Often times students have trouble focusing and discovering what to look for while watching a video. Clickberry could provide teachers a way to incorporate content information into the videos they are watching. Another week has gone by and a few days remain in the 2012-2013 school year. Below are 5 recent posts from my Feed.ly that I wanted to share. Feel free to pass these along if you like them as well. 1.) Last week was "Teacher Appreciation Week" and Angela Maiers has organized her Favorite Posts for Teacher Appreciation Week. Great posts for a quick pick me up. 2.) Those of us with 1:1 or BYOT programs in our schools should be familiar with Backchanneling and how to utilize it in the classroom. The Langwitches Blog recently had a post Stepping Up the Backchannel in the Classroom. If you find yourself wanting to utilize this tool and strategy, or are looking for a way to improve, this would be a good starting point. 3.) The Speed of Creativity has done some posts recently sharing classes use of "Paper Slides" as an project in their classrooms using the technology that has been made available to them. Here is an example of a Paper Slide Project related to the Egypt After Arab Spring. Paper Slides are becoming a popular project method for classrooms to present information. I have recommended it to several teachers through the past couple years. 4.) Looking for some blogs to start reading? Free Technology for Teachers is a blog a follow and he recently shared his Ten Blogs I Read First and thought it would be a great share for those looking for blogs to start following. 5.) Lifehacker is a blog that I had seen before but never really followed until recently. They recently shared a post comparing Evernote and Springpad and which someone would use to help them get organized. If you are unsure, this would be a good start.